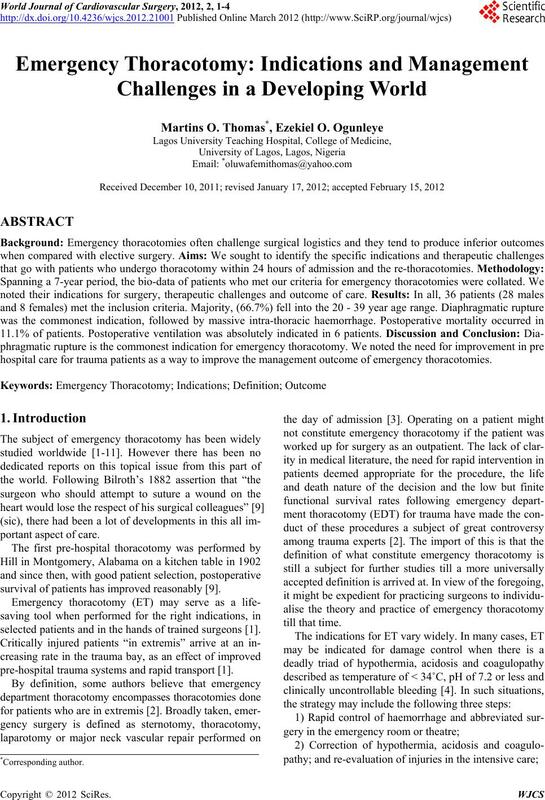 hospital care for trauma patients as a way to improve the management outcome of emergency thoracotomies. survival of patients has improved reasonably . selected patients and in the hands of trained surgeons . pre-hospital trauma systems an d rapid transport . 3) Definitive surgery in the theatre. blood transfus ion (OR 2.1) in all P < 0.05.
care including complications and interventions. SpO2 (<80%) with intra-nasal ox ygen. duced only 5 patients constituting 13.9% of the cases. Skewness of +0. 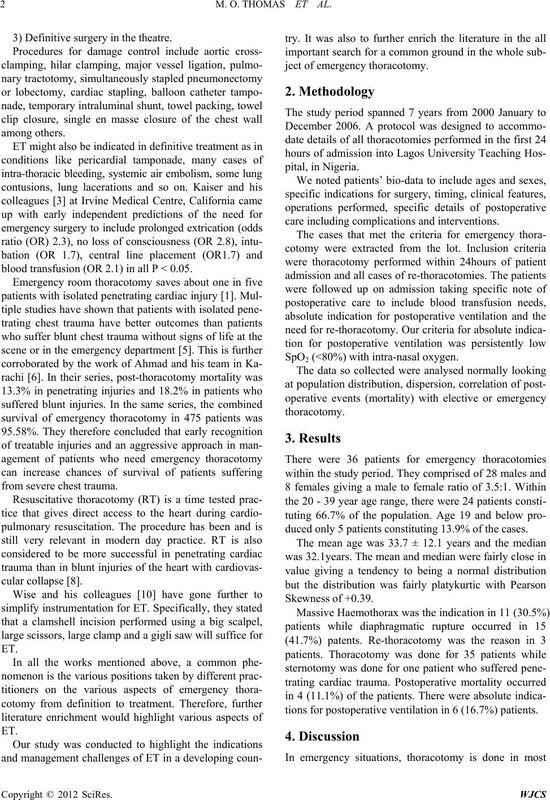 39 .
tions for postoperative ventilatio n in 6 (16.7%) patients. chest trauma, cardiac arrest and other similar conditions. the component parts of ET (vide supra). of the massive haemothorax rate in our study. Table 1. Indications for emergency thoracotomy. would have died at the pre-hospital level. the frequent suspicion of add itional in tra-thoracic in juries. Cardiovascular Surgery, Vol. 20, No. 1, 2008, pp. 13-18. M. Kaiser, P. Ahearn, X. M. Nguyen, A. Barleben, M.
Patients,” American Surgery, Vol. 75, No. 10, 2009, pp. Nippon Geka Gakkai Zasshi, Vol. 103, No. 7, 2002, pp. cine, Vol. 32, No. 1, 2007, pp. 99-103. M. Ben khadra, D. Honnart, F. Lenfant, P. Trouilloud, C.
Medical Journal, Vol. 81, No. 5, 2009, pp. 195-198. 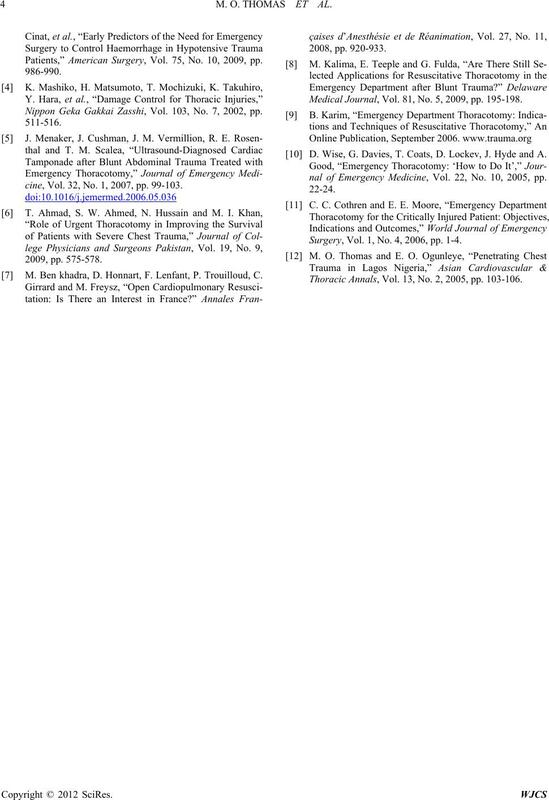 D. Wise, G. Davies, T. Coats, D. Lockev, J. Hyde and A.
nal of Emergency Medicine, Vol. 22, No. 10, 2005, pp. Surgery, Vol. 1, No. 4, 2006, pp. 1-4. 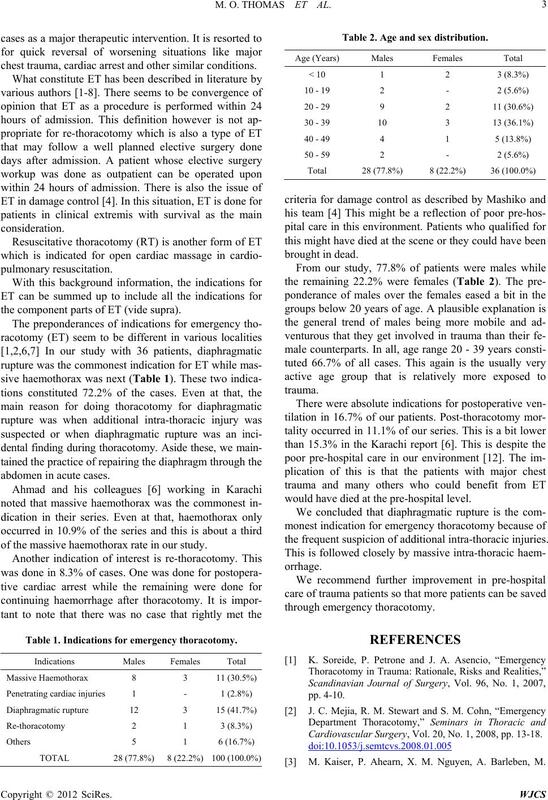 Thoracic Annals, Vol. 13, No. 2, 2005, pp. 103-106.